The University of Oklahoma is home to five Greek councils, each offering a unique experience in fraternity and sorority life. From social-interest organizations, to organizations centered around religion, culture, and even academic programs, there is a Greek experience for all students at the University of Oklahoma. Visit www.greek.ou.edu to learn more about our Greek councils at OU. The Interfraternity Council is home to 18 fraternities. It is the second-largest council on campus with over 2,100 members and is comprised of social-interest organizations. To learn more about IFC, visit ifc.ou.edu. The Independent Greek Council is home to 11 special-interest organizations, comprised of six fraternities and five sororities. With over 500 members, IGC is the fastest-growing council at OU. To learn more, visit link.ou.edu/igc. The Multicultural Greek Council is comprised of 12 culturally-based organizations - seven sororities and five fraternities. MGC is home to over 200 members and is one of the largest and healthiest multicultural councils in the nation. Visit mgc.ou.edu to learn more. The National Pan-Hellenic Council is home to the â&#x20AC;&#x153;Divine Nineâ&#x20AC;? historically black fraternities and sororities. With over 50 members, NPHC is quickly growing. The University of Oklahoma is proud to be the only institution in the Big XII to host all nine NPHC charters. Learn more at link.ou.edu/nphc. The Panhellenic Association is the largest Greek council on campus with over 3,100 members in 11 chapters. Comprised of social-interest organizations, the Panhellenic Association is also the largest womenâ&#x20AC;&#x2122;s organization on campus. Visit pan.ou.edu to learn more. The Panhellenic Association has been the center for womenâ&#x20AC;&#x2122;s leadership and service on campus since 1909. The council serves as the coordinating body of the 11 National Panhellenic Conference affiliated sororities on campus and promotes our four core values in all we do - scholarship, service, leadership, and sisterhood. Greek organizations were founded on the principle of exceptional scholarship. Our council and chapters provide academic mentoring, tutoring services, time management seminars, proctored study halls, and information on free campus resources to members. Sorority women recognize the need for service in their communities. All of our organizations provides assistance to their individual philanthropic organizations, as well as Panhellenicâ&#x20AC;&#x2122;s official philanthropy, the United Way of Norman. Greek life is a direct springboard into campus engagement. Panhellenic membership provides multiple leadership development opportunities to help members grow as leaders during and after the collegiate experience. We, as undergraduate members of womenâ&#x20AC;&#x2122;s fraternities, stand for good scholarship, for guarding of good health, for maintenance of fine standards, and for serving, to the best of our ability, our college community. Cooperation for furthering fraternity life, in harmony with its best possibilities, is the ideal that shall guide our fraternity activities. We, as fraternity women, stand for service through the development of character inspired by the close contact and deep friendships of individual fraternity and Panhellenic life. The opportunity for wide and wise human contact, through mutual respect and helpfulness is the tenet by which we strive to live. Joining a Panhellenic organization means having over 3,000 women on your team. Sororities offer new friends, lifelong bonds, and invaluable experiences that will last long after your collegiate years are over. The University of Oklahoma Panhellenic Association is a vibrant community filled with scholars, leaders, and engaged citizens. We pride ourselves on bringing excellence to our community each day. Take some time to learn about our community of sorority women. Panhellenic Executive Team The Panhellenic Association at the University of Oklahoma is a student-led organization, with current students comprising our executive council team. These women are elected in November and serve a full term from January - December. Each Panhellenic Executive Team member is a sorority woman at the University of Oklahoma in good standing with her chapter. During Formal Recruitment, these women will be in the Panhellenic Headquarters Office located in the residence halls. The Panhellenic Executive Team will serve as Panhellenic staff in the summer and are happy to provide assistance or answer questions you might have about Formal Recruitment, Continuous Open Bidding, or general Panhellenic information. Panhellenic Executive Team from left: McKenzi Ormsbee, VP Recruitment Operations; Taylor McElderry, VP Community Relations; Kalee Brightmire, VP Public Affairs; Grace McClelland, VP Judicial Affairs; Katelyn Leeviraphan, Panhellenic President; Chelsea Jackson, VP Finance; Taylor Cox, VP Recruitment Programming; Hailey Thomas, VP Programming; Madison Ong, VP Administrative Affairs. The process by which most Panhellenic members join their organizations. Formal Recruitment begins several days before classes begin in the fall term. Fewer women join our community through Informal Recruitment (75-100 each term) than Formal Recruitment (900-1000 in the fall term). This process is formalized. Potential New Members receive party schedules from the Panhellenic staff each morning during the process. This process is informal in nature. Chapters drive the process and invite women to recruitment events independent from Panhellenic. Formal Recruitment only occurs in the fall term. Informal Recruitment occurs in the fall and spring semesters. During Formal Recruitment, chapters are allowed to recruit up to quota, or the number of potential new members (determined at the end of recruitment) that each chapter is allowed to pledge regardless of a chapter’s total membership number. During Informal Recruitment, only chapters that have not pledged to campus total are eligible to participate. Total is automatically reset within 72 hours following primary, or Fall Formal Recruitment. All 11 Panhellenic organizations participate in Formal Recruitment. Only chapters that are below campus total can participate in Informal Recruitment. There is no correct way to join a Panhellenic organization. Our team encourages you to find the recruitment process that best suits your personality and your circumstance. If you have additional questions or want to talk about your options, please reach out to us at panhellenic@ou.edu or by calling (405) 325-3163. The University of Oklahoma Panhellenic Association strives to make every year of the sorority experience a great one. However, we recognize the first year can be the most exciting and influential of all. Below are some things you can expect during your first year of membership in a Panhellenic chapter. hours to be completed during the week. Sororities also implement a number of educational programs to assist new members in the academic transition into college. As a new member, you will be required to attend weekly new member meetings in addition to weekly chapter meetings. The goals of these meetings is to teach new members the values, traditions, and rituals of the organization. philanthropy and will host events each semester to raise awareness and donations for the cause. New members are invited to attend these events as a way to socialize within the community while supporting a worthy cause. help their new members prepare for next yearâ&#x20AC;&#x2122;s Formal Recruitment process. Safebreak is an annual event hosted by the Panhellenic Association each year before Spring Break. The event is focused on safety and smart decision-making during Spring Break. Each year, we celebrate the life of Lisa Weider a beloved member of the Panhellenic community and Alpha Omicron Pi sisterhood at OU who tragically passed away during her Spring Break vacation in 2004. As a new member, you will be encouraged to participate in campus and Greek-wide events such as The Big Event, Soonerthon, and Homecoming. These events are not only fun, but provide an opportunity to meet and work with students from across campus. Financial requirements are an important consideration for women participating in sorority recruitment, so it is important to be as informed as possible with the costs associated with the sorority experience. If you accept an invitation to join a chapter, you will enter into a financial agreement and contract for housing and membership dues and fees during your collegiate years. Dues and fees vary from chapter to chapter and year to year. It is important to note sorority costs may be more expensive during your first year in the organization due to one-time fees and expenses. It is also important to note that additional costs may arise during the year for items such as pictures, t-shirts, or other miscellaneous items. At the University of Oklahoma, 75.3% of Panhellenic women received financial aid in 2017-2018 and over $10 million in scholarships have been awarded to Panhellenic members in the last year. 2017-2018 Financial Breakdown Costs below are for a full academic year at the University of Oklahoma. Member In-House Fees include room/board as well as organizational membership fees. All 11 of our Panhellenic organizations have chapter facilities. In the 2017-2018 academic year, about 29% of Panhellenic women lived in sorority chapter housing. Many of these facilities include full room/board, laundry, parking, and close access to campus. Panhellenic chapter houses employ full-time, livein House Directors, sometimes referred to affectionately as, “house mothers.” The House Director oversees the daily operations of the facility and ensures it meets all health and safety standards. Nearly 900 women live in Panhellenic chapter facilities each year. Women that live “in house” get to enjoy living with their sorority sisters. Most Panhellenic women live in their sophomore year and perhaps junior or senior years if involved in chapter leadership. Not all Panhellenic women live in chapter housing. Many live in on-campus housing, or privately owned off-campus housing options. Out of house members are always welcome in the facility and often eat 1-2 meal a week at the chapter house with friends and sisters. Recruitment Team The Panhellenic Association is a student-led organization and Panhellenic women step away from their chapters to join our full-time professional staff to organize and coordinate the formal recruitment process. Meet the 2018 Panhellenic Recruitment Team below! Being a sorority woman can be an integral part of your college years. Panhellenic chapters enhance the undergraduate experience and provide opportunities for you to become the best version of yourself. The University of Oklahomaâ&#x20AC;&#x2122;s Greek community is built on fostering high ideals of friendship, scholarship, community service and leadership. If you choose to become a part of this community, you will gain rewarding experiences and impacting memories. Sorority life allows you to become a key part of contributing to both the campus community and the university tradition that has been active since 1909. We would like to formally invite YOU to explore our 11 Panhellenic chapters and discover what we have to offer. We highly encourage you to participate in our recruitment programs. By choosing to go through recruitment, you are exposing yourself to a myriad of opportunities and connecting with exceptional members of the Greek community. Please take the time to read this guide to better help you understand how sorority life can benefit your college career -- and decide if the Formal Recruitment process is right for you. All of our Panhellenic chapters are unique and deliver something different to their individual members. We believe that there is a sorority for everyone at the University of Oklahoma and specifically one for YOU! Give the OU Greek system the opportunity to share with you what it has to offer. Boomer Sooner! Registration for the University of Oklahoma’s Panhellenic Association Formal Recruitment 2018 opens on May 15. After this date, you can log on to our website, www.pan.ou.edu to register. All potential new members must live in the residence halls during the Formal Recruitment process. For PNMs with 2018-2019 housing contracts, Housing & Food will place you in your permanent room upon move-in. Those not living in the residence halls for this academic year will be placed in a temporary room for the process. The cost of living in a residence hall room during Formal Recruitment is not included in the registration fee or your housing contract. Housing costs vary depending on location (Adams, Couch or Walker Center is $23.80 per night; Headington Hall ranges from $28.49 - $41.13 per night; Cate Center is $19.34 per night.) University Housing and Food Services will charge this fee to your university bursar account. Rates are subject to change pending University of Oklahoma Regents approval. A light breakfast, lunch and dinner will be provided on all days of Formal Recruitment except Move-In Day, Preference Round, and Bid Day. Be prepared. Have your updated resume, transcripts, and test scores nearby to plug into our online system. You will be prompted to enter this information that will be released to the 11 chapters. Make sure you know your OU Student ID number. Save a high-quality photo of yourself. Our online system will prompt you to upload an image with your profile. Make sure it is a high-quality image so that chapters will be able to clearly see you! Don’t be humble. This is a time to brag on yourself and all the awesome things you have done prior to going through recruitment. Be honest. Our team does cross-check grade data with the University of Oklahoma’s records office. The grades you were admitted to the university with will be the grades listed on your profile. E-mail panhellenic@ou.edu for questions. Make sure to submit your payment. You will not be registered for recruitment until you have submitted your $200 registration fee. Reach out with questions. Our team is here to help! Round I - Open House Round I of Formal Recruitment is an open house round, meaning all potential new members will visit all 11 Panhellenic chapter facilities over this two-day round. This round of recruitment focuses on the importance and excitement of “going Greek.” You will be greeted at each chapter facility by door songs are you are welcomed into the party. Round I is August 9 & 10 11 parties attended split between two days. Party rounds are 25 minutes. You will be grouped alphabetically and led to each chapter facility by your “walking group” Rho Gammas. TIPS & TR ICKS These two days are very long and you will talk to many people. Find a method to keep track of the chapters you visit to help with your selections at the end of Round I. We suggest wearing comfortable shoes - there is a lot of walking during this round of recruitment. W H AT TO E X P E CT This is a “get to know you” round. Members will be asking you about youself so have some talking points ready. Round I is a great time to ask general questions about sorority life at OU. You can ask more specific questions about the chapter during later rounds of recruitment. These first two days are the longest and you will be doing a lot of walking, so you will want to be dressed comfortably. You will be provided two T-shirts to wear during Round I by the Panhellenic Association that you will receive at move-in. We suggest some casual shorts or a casual skirt with tennis shoes, sandals, or any other comfortable shoes. Be yourself and wear what you feel best in! Round II - Philanthropy Round II of Formal Recruitment is focused largely on the Panhellenic pillar of philanthropy. PNMs will attend a maximum of 8 chapters after making selections following Round I. Each PNM will have her own party schedule that her Rho Gammas will deliver the morning of Round II. There will be Rho Gammas stationed in North and South Greek to direct PNMs to each chapter facility. Round II is August 11 PNMs can attend a maximum of 8 parties Party rounds are 35 minutes. Each PNM will have an individualized party schedule that will be delivered to her residence hall room by her Rho Gamma in the morning. TIPS & TR ICKS We suggest bringing an umbrella with you to recruitment. You never know when you might get caught in a rainstorm between party rounds. Round II of formal recuritment will fly by. The parties begin to get a little longer. Our team recommends wearing casual daytime dress - like a comfy sundress, skirt, or comfy casual pants that are just a set up from Round I. We recommend wearing flats or sandals. Our chapter facilities are spread out over a few blocks, so you will still likely be walking more than you might be used to. Much like Round I, we recommend wearing something you feel most comfortable in. Be yourself and wear something that you like! You will be able to focus on having great converstaions if you feel good about how you look. Wear flats or sandals this round. Thereâ&#x20AC;&#x2122;s still quite a bit of walking so comfort is key during Round II. W H AT TO E X P E CT Chapters will be telling you about their philanthropy and service they enjoy doing in the OU and Norman community. Think about what philanthropies you care about or service you have done. Ask about ways you can serve while in college and as a sororoity woman. Round III - Sisterhood Round III is our sisterhood round - a day that gives PNMs and chapter members the chance to connect about the values that drive their actions. PNMs will attend a maximum of 5 parties, each containing a tour of the chapter facility, longer conversation time to dig deeper into the values and sisterhood of our organizations, and more time for questions. Round III is August 12 PNMs can attend a maximum of 5 parties Party rounds are 45 minutes. Each PNM will have an individualized party schedule that will be delivered to her residence hall room by her Rho Gamma in the morning. TIPS & TR ICKS We suggest if you are going to wear heels that you bring comfy shoes to walk in to each chapter house. Bring a bag to stash your walking shoes in while you in the party. You can change shoes before going in. Keep in mind that you are going on house tours when choosing shoes for this round. W H AT TO E X P E CT Round III is focused on sisterhood, campus involvement, and values. Think about these things before the round begin. Think about asking questions about the chapterâ&#x20AC;&#x2122;s sisterhood traditions and what they do on campus. Find where you feel values match up. Round III of recruitment is a longer day. While PNMs will attend a maximum of 5 parties, these parties are 45 minutes long. This round of recruitment contains a house tour so think about that when choosing your shoes. We suggest wearing a nice sundress or something similar with wedges, flats, or heels. These outfits are some suggestions of attire for Round III, but please feel free to wear what you feel your best in. Round IV - Preference Preference round is the last round of Formal Recruitment before Bid Day! An invitation to preference round means the particular sorority is very interested in extending membership to you. The parties will focus on the core aspects of sorority life, including friendship, sisterhood, and tradition. This will be your last chance to interact with members before final selections are made. Round IV is August 13 PNMs can attend a maximum of 2 parties Party rounds are 75 minutes. Each PNM will have an individualized party schedule that will be delivered to her residence hall room by her Rho Gamma in the afternoon. TIPS & TR ICKS Preference round can be a long day, as party schdules arenâ&#x20AC;&#x2122;t distributed until the afternoon. Get some rest before evening party times begin. Make sure your phone is charged. You will make your final selections after your last party with Panhellenic on your phone. Attire for Preference round is typically more formal than other rounds of recruitment. Many women will choose to wear a cocktail dress or something similar with heels, or wedges. A great way to think of attire for this round is what you would wear to an evening wedding. Donâ&#x20AC;&#x2122;t feel like you need to go buy a new outfit for Preference round. Women wear all kinds of dresses or other formal outfits during this round of recruitment. Dress in a way that makes you feel like your best self - you will be able to better concentrate on conversations durnig this round. W H AT TO E X P E CT Parties during Preference round are longer than previous rounds. Expect to spend more time with chapter members. Preference round is a great time to ask any last-minute questions you might have. Chapter and Panhellenic team members are happy to help. We understand it is a big decision! Register for Fall Formal Recruitment at www.pan.ou.edu. Potential new members will the remaining chapters from the previous day. before this date to participate. Potential new members attend a maximum of eight parties. Last day for a registration refund minus $15 service charge. All requests must be in writing and sent to the Panhellenic email at panhellenic@ou.edu. Potential new members will visit half of the chapters. Round III - Sisterhood Day Potential new members attend a maximum of five parties. Potential new members attend a maximum of two parties. PNMs will also attend Fraternity and Sorority Student Life mandatory educational sessions in the afternoon. THURSDAY , AU G UST 16 - 19 Student Orientation Weekend Visit ou.edu/sow to learn more. Classes begin at the University of Oklahoma. A woman must be an enrolled, full-time undergraduate student at the University of Oklahoma (Norman or OUHSC campus) to be eligible to participate in formal or informal recruitment activities. Potential new members must register with the University of Oklahoma Panhellenic Association and pay the registration and housing fees in order to participate in Formal Recruitment. All women participating in Formal Recruitment must live in the residence halls during the week of recruitment. 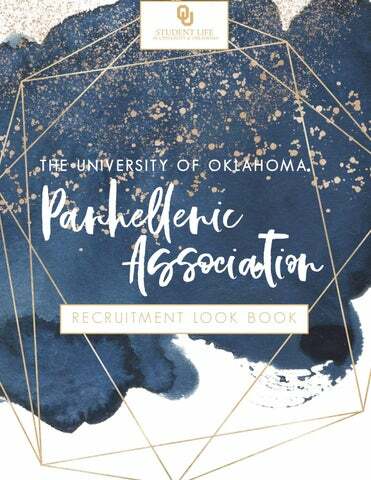 PNMs must abide by the Membership Recruitment Guidelines published in the University of Oklahoma Panhellenic Association Recruitment Look Book and NPC Unanimous Agreements. A PNM may not have guests (including family members) in her residence hall room from 8:00 PM on August 8, 2018 until after the distribution of bids on August 14, 2018. All guests must be met in the lobby area on the first floor of the residence halls. A potential new member should not be in contact with a chapter member, alumna member, or anyone acting on the sorority’s behalf during the summer months from May 11, 2018 - August 14, 2018, or any time outside a scheduled Formal Recruitment event. No woman is eligible to join a sorority in the summer months or anytime when school is not in session with the exception of the end of Formal Recruitment. PNMs participating in Formal Recruitment must wear the name tags provided by the Panhellenic Association during all Formal Recruitment activities. A legacy is defined as a daughter or sister of an initiated sorority member unless an international or national organization recognizes additional relations. PNMS participating in Formal Recruitment must be in their own residence hall room every night by 11:00 PM. A legacy may not be given any gifts by the legacy sorority. PNMs participating in Formal Recruitment may not visit any fraternity chapter from August 7, 2018 - August 21, 2018, Sorority women may not visit chapter facilities during fraternity recruitment. Potential new members may not spend the night at a sorority house unless prior approval is obtained from the Panhellenic Advisor. However, a legacy is permitted to spend the night at a legacy sorority house, upon invitation, during the academic year. PNMs must attend all Formal Recruitment events at the designated times. A PNM must receive prior approval from the Panhellenic Recruitment Chairmen or the Panhellenic Advisor to miss any event during the week. A PNM participating in Formal Recruitment shall not be, nor have ever been, an initiated member of a NPC organization. A woman is ineligible for membership recruitment if she has been a new member of a NPC sorority at the University of Oklahoma in the same calendar year. A woman shall complete the “Membership Recruitment Acceptance” card immediately following the last preference event she attends. Once a “Membership Recruitment Acceptance” has been signed and submitted, no changes may be made. A woman signing a “Membership Recruitment Acceptance” card and receiving a bid at the end of Formal Recruitment shall be bound to the chapter she matched by the agreement for one calendar year at the University of Oklahoma. Failure to follow any of these rules could result in dismissal from the Formal Recruitment process. Recruitment Policies The University of Oklahoma Panhellenic Association Membership Recruitment Guidelines are intended to help guide fraternity women and PNMs through the membership selection process and Formal Recruitment Week. The guidelines incorporate many of the procedures recommended by the National Panhellenic Conference. For more information, please visit www.npcwomen.org, www.pan.ou.edu, or give us a call at (405) 325-3163. A letter of recommendation, sometimes referred to as a “rec” or a RIF (Recommendation Information Form) is a recruitment information form that is completed by an alumna of a specific sorority. These forms are used to introduce a potential new member to the alumna’s sorority chapter at the University of Oklahoma. Sororities appreciate and use the information provided in letters of recommendation to assist in their recruitment selection process. Some sororities might require a letter of recommendation, but it is important to understand that, if a sorority requires a recommendation, it is that individual sorority’s responsibility to obtain said recommendation, not the responsibility of the potential new member. It is permissible for a PNM to ask a sorority alumna member to complete a recommendation for her own chapter. However, it is inappropriate for a PNM (or anyone on her behalf) to contact an alumna member that she does not know to ask for a recommendation. Each national sorority has its own guidelines and its own recommendation forms the alumna must use. If an alumna is not familiar with her own sorority’s regulations, she should contact the national organization. The OU Panhellenic Association has created a recommendation letter guide available at www.pan.ou.edu. Please refer to this guide for questions about the recommendation process. If you have additional questions, feel free to reach out for assistance. Always send a thank you note. Alumnae members are busy and sending them a brief thank you will let them know you appreciate them and their time. Know what to send. Chapters need only the recommendation forms from alumnae members. They do not need packets, gifts, or anything else mailed to their facilities. Forms can be sent to the chapter facilities themselves, or the Panhellenic office. Get them in early. There is no official deadline for when letters of recommendation must be received, but we suggest before August 1 to give the chapters ample time to process that paperwork. Use your network. If you are worried about finding references, ask teachers, coaches, family friends, or anyone else you feel comfortable talking to. You might find you know more sorority women than you think. Recruitment Guides, or Rho Gammas, are upperclassmen women from various chapters who step away from their chapters during the recruitment season in order to help potential new members navigate recruitment. Check out the advice, tips, and tricks below from some of this year’s Recruitment Guides! Be genuine and be you - worry about how you feel in each chapter, rather than what others think. Go through the process as the most genuine you and you will find the place for you. During the week of recruitment, it is all about you so don’t be afraid to be selfish, the girls you will talk to want to get to know you. It’s your time to shine! Don’t try to put a mask on trying to be someone you’re not. Talk about the things you love and no matter what, be yourself during the Formal Recruitment process! Bring a big purse with a lot of little emergency items! Makeup to touch up with, band-aids, deodorant—anything really. It’s reassuring to have in situations and if you don’t need it, the girl next to you in your group might! Nerves are okay. Embrace them! Everyone is nervous, even the girls on the other side. Be unapologetically yourself and everything will fall into place. I remember spending hours worrying about what I was going to wear and it’s just not that big of a deal! Your priority should be comfort and confidence. The chapters want to get to know YOU and could care less where you got your shorts or jewelry. When a woman only lists one sorority on her Membership Recruitment Acceptance Binding Agreement (MRABA) form when two options are available. Women who ISP are not maximizing their options. Sorority members who are no longer active, collegiate members of a Panhellenic organization. A fully initiated member of a sorority who is currently participating as a member. Also known as a pin, the badge is an item of jewelry given to members upon initiation. Badges are often worn to chapter events and functions. An invitation to join a Panhellenic sorority. Bid are given during formal or informal recruitment to potential new members. Once a potential new member accepts a bid, they become a new member. The daughter, sister, grandchild (and in rarer cases niece) of an organization’s member. National organizations determine legacy status for that specific organization. LITTLE SISTER Sometimes called “littles.” This is the nickname for a Big’s new member that they mentor during their collegiate career. Nickname for a big sister, a mentor assigned to a new member. Many organizations have special names and ceremonies for these pairings. A phrase used during the primary, fall formal recruitment process. To maximize your options means to utilize the options available to you. At the Univeristy of Oklahoma, you are required to maximize your options in each round with the exception of Preference Round (Round IV). Maximizing your options is always recommended. A branch of a national fraternity or sorority established at a campus. Each will have their own name, usually designated by Greek letters. An informal recruitment process that Panhellenic sororities use to recruit new members outside of the primary formal recruitment period. This type of recruitment is also called “informal recruitment” or “spring recruitment” during the spring term. Also known as “NPC.” NPC provides support and guidance for its 26 member international sororities / women’s fraternities. A woman who has accepted a sorority bid but is not yet an initiated member. A ceremony during which new members receive full and life-long membership privileges. Initaition ceremonies are held during the first semester of membership. POTENTIAL NEW MEMBER A PNM is a woman going through any kind of Panhellenic recruitment process. Visit pan.ou.edu for individual chapter house addresses. Continuous Open Bidding Continuous Open Bidding (COB), sometimes referred to as â&#x20AC;&#x153;Informal Recruitment,â&#x20AC;? is a way for women interested in joining our Panhellenic system to become members in a less formal way. Continuous Open Bidding is a chapter-driven process through which chapters invite women to recruitment events independent from Panhellenic. This type of recruitment process happens in the spring and fall terms. Registration for Fall 2018 COB will open at 2:00 PM on August 14. Access the form at pan.ou.edu or by visiting the Panhellenic Org Sync portal. Registration for Spring 2019 COB will open mid-December 2018. Access the form at pan.ou.edu or by visiting the Panhellenic Org Sync portal. Chapter participation will be determined following Formal Recruitment 2018. For questions on chapters that will be COB eligible, please email panhellenic@ou.edu after 2:00 PM on August 14. Chapter participation will be determined following the reset of total on January 16, 2019. For questions on chapters that will be COB eligible, feel free to reach out after January 16. Last fall, 5 chapters were COB-eligible and about 40 women joined our community through the informal recruitment process. Last spring, 5 chapters were COB-eligible and about 80 women joined our community through the informal recruitment process. It is important to note that should you decide to go through the formal recruitment process and be matched with a chapter after preference round, you will not be eligible to participate in any kind of Panhellenic recruitment process at OU until the start of the next primary recruitment period (Fall 2019 Formal Recruitment). Our team can help you determine your eligibility should you have questions. In the spring, Panhellenic will host a informational meeting the first week of the spring term. Follow us on social media to hear about that event as the date approaches. Should you participate in Formal Recruitment and be matched with a chapter after preference round, you will not be eligible to participate in COB during the spring 2018 term. Registration for COB is free. You can access the form at pan.ou.edu or by visiting the Panhellenic Org Sync portal. The information you provide will be sent to COB-eligible chapters in that semester. Should you wish to participate in COB in different semesters, that form will need to be filled out for each term participation occurs. Signing up for COB is quick and easy. You can visit pan.ou.edu or the Panhellenic Org Sync portal to fill out the form. This form will be distributed to all COB-eligible chapters. What chapters participate in COB? Unlike Formal Recruitment, not all of our 11 chapters will participate in COB. Each term, campus total is calculated using chapter median size. Any chapters that are not at or above the campus total number are eligible to participate in COB. How can I find out of I am COB-eligible? COB-eligiblity is determined on several factors. If you have never gone through a Panhellenic recruitment process and have never been affiliated in any way with a NPC organization, you are COB eligible! Women who went through the Formal Recruitment process and were matched with a chapter after preference round are not COB eligible until the following year. For questions about your COB-eligiblity, please call (405) 325-3163 or email panhellenic@ou.edu. Our team can help you determine if you are COB-eligible for that term. How will chapters know I want to participate? The Panhellenic Vice President of Recruitment Programming or the Panhellenic Adviser will give a copy of your Informal Recruitment Information Form to all eligible chapters. The chapters will then contact you directly if they are interested in inviting you to a recruitment event. These recruitment events are often informal in nature. Some examples can include: dinner at the chapter house, grabbing frozen yogurt with current members, a movie night or game night with the chapter, or attending an OU event or sporting event. Chapters arrange these events and control the guest lists. Greek or Panhellenic membership can come with many questions. We have provided some frequently asked questions our team gets. However, if you have additional questions or need assistance, please don’t hesitate to reach out. The Panhellenic team is always happy to assist where we can. You can reach us at panhellenic@ou.edu or by calling (405) 325-3163 during business hours (Monday - Friday 8:00 a.m. - 5:00 p.m.
HOW MUCH TIME DOES A SORORITY REQUIRE? HOW LONG DOES IT TAKE TO BE INITIATED? There is a required meeting once a week where you will exchange information on chapter events and fraternity education. Weekly chapter study sessions are an option for all members, along with events such as sisterhood activities, community service projects and social events. Most chapters have an initiation period that ranges from four to 12 weeks. The new member period offers opportunities to meet other members, learn fraternity history, and establish a level of comfort within the chapter. Each chapter builds its own new member program and sets its own initiation dates. ARE UPPERCLASSMEN ALLOWED TO PARTICIPATE IN RECRUITMENT ACTIVITIES? Many sororities look for a four year commitment; however, most of our groups do consider upperclassmen in their recruitment process. Fewer upperclassmen than freshmen participate in Formal Recruitment and fewer join chapters. We cannot predict any one person’s recruitment experience. The best advice is to go through the process with an open mind. IS THERE A GPA REQUIREMENT TO PARTICIPATE IN FORMAL OR INFORMAL RECRUITMENT? The OU Panhellenic Association does not require a certain GPA to participate in Formal Recruitment. However, each sorority has a minimum GPA to be considered for membership and initiation. The average GPA to join is around a 2.39 an the average GPA for an upperclass student is around a 3.00. These grades are pulled from university records. DO I NEED TO ATTEND ALL PARTIES LISTED ON MY RECRUITMENT SCHEDULE? Yes. The objective of recruitment as a potential new member is to learn as much as you can about the OU Greek community and the chapters so you can make an informed decision regarding membership. If you intentionally miss an event you were invited to, you are not maximizing your options and could be released from the Formal Recruitment process. Your Rho Gammas will be helpful in answering questions about maximizing your options and what that looks like for you as a PNM. WHAT DOES IT MEAN TO “MAXIMIZE MY OPTIONS” DURING RECRUIMENT? When a PNM makes a selection, it is in her best interest to rank all of the chapters she attended during that round. By ranking all chapters, she maximizes her ability to receive an invitation from any chapter for the next round. If a PNM does not maximize her options, it is possible that she will receive zero invitations for the next round. OU Panhellenic strongly discourages intentional single preference. We will cover this in detail prior to selections each round of recruitment, especially Preference Round. WILL ALL PARTICIPANTS PLEDGE A SORORITY AT THE END OF THE FORMAL RECRUITMENT PROCESS? Recruitment is a process of mutual selection and, as such, there are many different outcomes to this process. Participation in Formal Recruitment does not guarantee an invitation to join a sorority, nor does it obligate you to join. However, approximately 80-90% of the women participating in Formal Recruitment each year join a sorority at the end of the week! We encourage all women to go through our process with an open mind. An open mind allows women to meet others and find the chapter they feel the most at home in. Some women do decide that sorority life is not for them at during the recruitment process. We work with these women to get them plugged in on campus if they decide to withdraw from formal recruitment. WHAT IF I WANT TO BE IN A CERTAIN SORORITY? WHAT SHOULD I BRING TO RECRUITMENT? Only wanting to be a member of one specific sorority or only considering a few chapters can severely limit a PNM’s options for membership and can lead to disappointment. Panhellenic discourages joining a sorority based on stereotypes or others’ opinions. We encourage you to keep an open mind and make a decision that is best for you. Two Panhellenic t-shirts will be provided for potential new members to wear on Round 1 (days 1 and 2). WHAT IS A LEACY? A legacy can be defined differently by each chapter, but most commonly, a legacy is defined as a potential new member who is the sister, daughter, or granddaughter of an alumnae sorority member. AM I GUARANTEED A BID IF I AM A LEGACY? If you are legacy you are not guaranteed a bid to your legacy’s chapter. It does not hurt or help to be a legacy; it just notifies our chapters that you have a family member that was a part of that specific organization. Each chapter looks at the individual going through and will make their decision on what is best for their group at that time. We would encourage you to go through the process with an open mind. The Panhellenic Association allows women to claim a legacy on their recruitment registration form. However, only the chapter(s) you claim will see that you are a legacy of that speficic organization. We do not share legacy status with any other chapters. DOES THE UNIVERSITY NEED A COPY OF MY ACADEMIC TRANSCIPT FOR RECRUITMENT? The Panhellenic Association will verify grade and test information from a potential new member based off of what she was admitted to the University of Oklahoma with. If a potential new member’s academic records are updated with the university, please email Panhellenic (panhellenic@ou.edu) with your name, student ID number, and a brief message explaining that your academic records with Panhellenic need to be updated. Other helpful hints: -Consider bringing a change of shoes. There is a lot of walking during recruitment from chapter facility to chapter facility and bringing a change of shoes is strongly advised. -Plan ahead. Many women find it helpful to bring a bag with them with face towels, personal fans or cosmetic products. -Water is provided for women going through the recruitment process but bringing a water bottle is advised as well. -Don’t be afraid to ask for tips. Recruitment Guides are great resources for women going through the recruitment process and can provide helpful hints and tricks for a positive experience. ARE LETTERS OF RECOMMENATION REQUIRED? No. Letters of reommendation are not required by Panhellenic or any of our member chapters for membership. However, many women choose to ask alumnae of various organizations to complete a RIF (Recruitment Information Form), sometimes called a “rec letter” on their behalf. If you choose to do this, we recommend having those forms to the chapters by August 1. If you do not know an alumna of a certain chapter it is inappropriate for you to ask someone that you do not know to write a recommendation form for you. Each chapter knows that it is their responsibility to find a recommendation for women going through the recruitment process that they would like to pledge. We hope this guide has answered the many questions you may have about Panhellenic Formal Recruitment. We understand this can be a daunting process, but it is such a fun one with so many people on your team. The entire Panhellenic team is here to assist you before, during, and after recruitment. Please donâ&#x20AC;&#x2122;t hesitate to reach out for assistance, questions, or advice. We are here for you! Find us on social media (@oupanhellenic), stop in during our office hours (Monday Friday 8:00 a.m. - 5:00 p.m.), or give us a call. areas of career services, and volunteer activities, help them thrive at OU,leader on campus and in life. As part of your student activities, student housing andinfood, andyour student’slifesupport system, youconduct, play a critical role helping health alsoorientation provide student affairs services on our studentservices. succeedWe from through graduation. We are Tulsa, Health Sciences Center, eager to join you in that effort. and Arezzo, Italy campuses. The Parent and Family Programs Office is conveniently located in the Oklahoma Memorial Union and open during business hours. If you have any questions or concerns, we hope you will reach out to us during this season of transition. July 12-13 or July 19-20 Registration is open on our website. And during the school year: Dad’s Day Weekend this fall and Mom’s Day in the spring. The whole family is welcome! ÂŠ2015 The Coca-Cola Company. All Rights Reserved.